Crown copyright ©. The 2013 Parliamentary Counsel Office Annual Report is licensed under a Creative Commons Attribution 3.0 New Zealand Licence. In essence, you are free to copy, distribute, and adapt the work, as long as you attribute the work to the Parliamentary Counsel Office and abide by the other licence terms. Please note that neither the Parliamentary Counsel Office logo nor the New Zealand Government logo may be used in any way that infringes any provision of the Flags, Emblems, and Names Protection Act 1981 or would infringe such provision if the relevant use occurred within New Zealand. Attribution to the Parliamentary Counsel Office should be in written form and not by reproduction of the Parliamentary Counsel Office logo or the New Zealand Government logo. I am pleased to present to you the Report of the Parliamentary Counsel Office for the year ended 30 June 2013. This is the Annual Report of the Parliamentary Counsel Office (PCO) for the 2012/13 year. In preparing the report, the PCO has followed the guidance provided by the Treasury.1 This report, together with the PCO’s Statement of Intent2 and Information Supporting the Estimates,3 form the components of the Managing for Outcomes framework. The last financial year has seen an increase in Treaty settlement Bills being drafted and enacted (eight enacted, excluding amendment Bills, and three more introduced). Some of these Bills are complex and lengthy (Te Tau Ihu Claims Settlement Bill is approximately 480 pages long). The current legislative environment continues to require Bills to be drafted quickly, often in tandem with the policy development process. This has resulted in some cases in significant amendments being required as Bills progress through Parliament. This developing trend is reflected in the increase in the number of Supplementary Order Papers (SOPs) drafted (some of which are substantial) and the need to allocate increased drafting resources to cope with amendments at the select committee and committee of the whole House stages. The speed at which Bills are drafted to meet introduction time lines has also had a measurable impact upon the ability of the PCO to meet its minimum peer review and proofreading standards (refer to Output Class—Law Drafting Services). In the access to legislation area, the key focus has been on completing a tender process to select providers for the hosting, on-going support, and further development of the New Zealand Legislation (NZL) system, a core asset for the PCO. 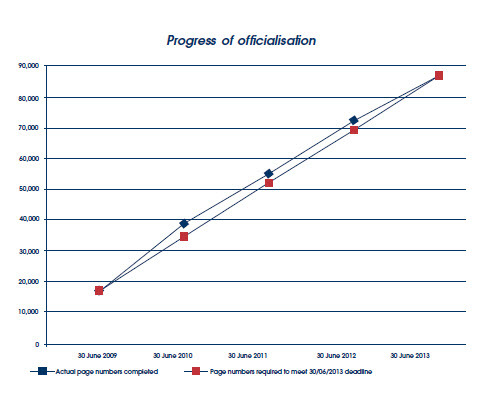 The other area of emphasis has been the completion of the officialisation6 programme. This year has been one of significant achievement and delivery for the PCO, and coupled with further changes to the support arrangements for the NZL system. The substantive outcomes and the high quality work involved in delivering them are a tribute to the creativity and dedication of all in the PCO. The PCO drafted 51 Government Bills and 414 Statutory Regulations in the 2012 calendar year. The Legislation Act 2012 was passed in December 2012 and replaced the PCO’s former governing statute (Statutes Drafting and Compilation Act 1920) and associated legislation (Acts and Regulations Publication Act 1989 and Regulations (Disallowance) Act 1989). It modernises and improves the law regarding the publication of legislation and the PCO. Use of the NZL website7 continued to increase over the year. New functionality has been implemented within the NZL system. A set of improvements to the NZL website was released. The officialisation programme of the legislation displayed on the NZL website back to 1931 was completed. A tender process to select providers for the hosting, on-going support, and development of the NZL system was completed using the all-of-government procurement process. The PCO continues to maintain a very constructive relationship with the Law Commission. The PCO is currently assisting the Law Commission with a Trustees Bill and a rewrite of the Crown Proceedings Act. The Chief Parliamentary Counsel is a member of the Legislation Advisory Committee (LAC) established by the Minister of Justice in 1986. The LAC advises the Government on good legislative practice and scrutinises the legislative work of the Government, making submissions to select committees where appropriate. Parliamentary Counsel have been heavily involved in assisting the LAC to achieve its outcomes this year. In July 2012, the PCO, with the LAC and the Office of the Clerk of the House of Representatives, provided a successful joint seminar to 180 policy and legal officials on “The Making of Quality Legislation”. 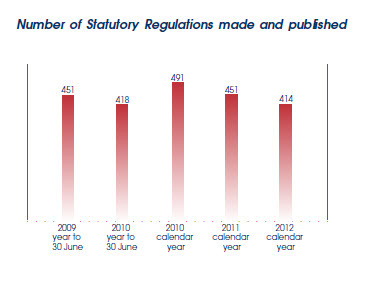 In the calendar year 2012, 414 Statutory Regulations were drafted. In general, Acts of Parliament contain the main policy components of a legislative regime while Statutory Regulations contain much of the essential detail and administrative mechanisms to make the Act work. It is often through such delegated legislation that a legislative regime has its greatest impact. All proposed Statutory Regulations that are to be made by the Governor-General in Council are considered by the Cabinet Legislation Committee and by Cabinet before they are submitted to the Governor-General in Executive Council. Unlike the drafting of Bills, drafting Statutory Regulations and other legislative instruments can give rise to complex legal questions about whether there is power to make the regulations or instrument under the relevant Act. Parliamentary Counsel are required to certify whether proposed Statutory Regulations are in order for submission to Cabinet, that is, whether there is any question about the power to make them and whether there is any ground on which they may be challenged under the Standing Orders of the House or disallowed under the Regulations (Disallowance) Act 1989 (since replaced by Part 3 of the Legislation Act 2012). The PCO also provides drafting assistance to the Rules Committee, established under section 51B of the Judicature Act 1908. Rules of practice and procedure for the Supreme Court, Court of Appeal, High Court, and District Courts are made by the Governor-General by Order in Council with the concurrence of the Rules Committee. This work is performed in addition to the PCO’s core work on the Government legislation programme. It can be demanding, detailed, and time-consuming work dependent upon the scale and speed of change the Rules Committee contemplates. The guidance material available to PCO staff involved in drafting legislation includes the PCO Style Manual and the PCO Drafting Manual. The Style Manual was substantially revised to make it easier to use in the 2012/13 financial year. The PCO’s Guide to Working with the Parliamentary Counsel Office, a regular newsletter, and a dedicated section of the PCO website are designed to assist departments in working effectively with the PCO, particularly when giving instructions and responding to drafts. Parliamentary Counsel have presented seminars on the subject to departmental officials and wider audiences this year. The PCO gave a joint presentation with the Office of the Clerk for new instructors on 7 March 2013 attended by over 200 people. The PCO has also participated in the development of the Government Legal Services project. The assistance is focused on the Cook Islands, Niue, and Tokelau, being the three other nations within the Realm of New Zealand. Assistance will be extended to other Pacific Island nations if resources permit. The assistance being provided includes drafting legislation for nations in order to increase their drafting capacity, preparing Guides to Preparing Instructions for the Drafting of Legislation, preparing sets of Legislative Drafting Directives, creating electronic drafting templates for Bills and for regulations, and training and mentoring on-island officials. The PCO has also been proactively engaging with other legislative drafting assistance providers around the world, and forums and agencies across the Pacific, in order to co-ordinate the work that is being done in the Pacific. This includes the Pacific Islands Forum Secretariat, the Pacific Islands Law Officers’ Network, the Commonwealth Secretariat, and various divisions of the Australian Attorney-General’s Department. The PCO has strengthened its involvement with the Commonwealth Association of Legislative Counsel (CALC). Fiona Leonard, Acting Deputy Chief Parliamentary Counsel, was re-elected as CALC Secretary. David Noble, Chief Parliamentary Counsel and a CALC Council member for Australasia and the Pacific, represented the association at a number of meetings with the Commonwealth Secretariat. Richard Wallace, Acting Drafting Team Manager, attended the Pacific Islands Law Officers’ Network (PILON) annual meeting in Papua New Guinea. PILON is a network of senior public law officers from Pacific Island countries, including Australia and New Zealand, which focuses on common legal issues within the Pacific region. 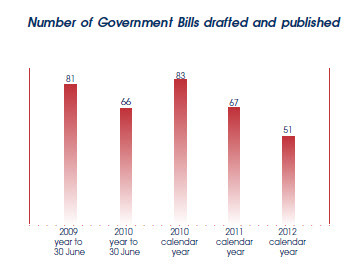 The following graphs compare the numbers of Government Bills drafted and published and Statutory Regulations made and published, plus the numbers of SOPs drafted and published, in the financial years ending 30 June 2009 and 30 June 2010, and the calendar years from 2010 to 2012. The current legislative environment requires Bills to be drafted quickly, often in tandem with the policy development process. This has resulted in significant amendments being required as Bills are progressed through Parliament and is reflected in the increase in the number of SOPs drafted. Over the last year the PCO has continued to make progress in achieving its strategic goal of simplifying the NZL system by reducing its technical complexity, implementing all-of-government initiatives, and improving the usability of the system. New functionality has been implemented that is of significant business value, and the migration to all-of-government Infrastructure-as-a-Service has significantly increased the performance of the system. In the 2012/13 year, a tender process to select providers for the hosting, on-going support, and further development of the NZL system was completed. Previously, there had been a single external service provider for all three areas. As a result of the tender, a number of panel contracts for services have been established. The PCO is now using all-of-government ICT shared services for key elements of its information technology needs, and has brought other day-to-day operations in house. Public use of the NZL website continues to increase strongly following the redesign in April 2012. 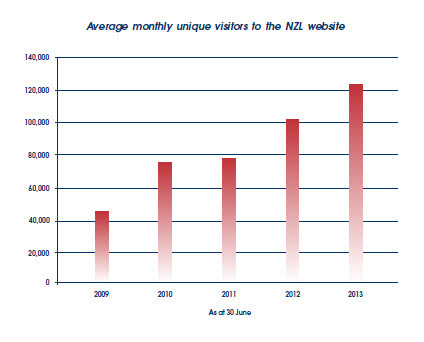 The graph below shows the average monthly number of unique visitors to the NZL website in each of the past five years. The PCO released a set of further improvements to the NZL website in February 2013, which built on changes released in the previous financial year. enhancements to the "custom web feed" function, which alerts users to changes to legislation. During the reporting period, the PCO also set the 2012/13 reprints programme. A total of 19 titles (17 Acts and two sets of Statutory Regulations) were scheduled for printing in hard copy. Over 730 Acts and Statutory Regulations are now subject to amendment as of 1 July 2013, which affected all of the reprints scheduled to be published in 2012/13. Those 19 titles will now be published in the 2013/14 financial year to include those 1 July amendments. The Tables of New Zealand Acts and Ordinances and Statutory Regulations and Deemed Regulations in Force as at 1 January 2013 were published in April 2013. Officialisation of 360 items of legislation from 1971 to 1931 (307 Acts, including two Imperial Acts, and 53 Statutory Regulations) was completed, comprising a total of 14,552 pages. This means that, as at 30 June 2013, the officialisation programme has been completed, as planned, in the 2012/13 financial year. The PCO is now reviewing the audits of those files to assess the legal effect (if any) of any errors in those files, with a view to declaring the database an official source of legislation under the Legislation Act 2012. The results of auditing carried out to date have given a high level of confidence in the officialised database. * Of the six Parliamentary Counsel who left the PCO in the 2012/13 year, three retired, one resigned to relocate overseas, and two resigned to pursue other opportunities. The PCO does not regard the turnover rate for 2012/13 as an issue. Three staff acted in senior roles in the 2012/13 year and gained higher level management skills. In addition, a number of staff have undertaken secondments outside the PCO to gain experience and to develop additional skills. A number of managers also had mentors outside of the PCO. In December 2012, the PCO undertook a Kenexa staff engagement survey. The results show that the PCO is one of the leading organisations within the state sector in terms of employee engagement and performance enablement. The PCO’s Senior Management Team continues to investigate further opportunities to increase staff engagement. The performance management system is fully operational with managers and staff agreeing on annual objectives at the beginning of the cycle year, reviewing progress throughout the year, and summarising achievements at the end of the year. HR policies are reviewed and made available to staff via the PCO intranet to ensure up-to-date policies and procedures are maintained. Following the passing of the Legislation Act 2012, the PCO has established an appointment review procedure, and all staff are now on individual employment agreements. The PCO’s flexible work arrangements have been utilised by staff. Managers continue to apply EEO principles including by ensuring that remuneration adjustments are equitable. 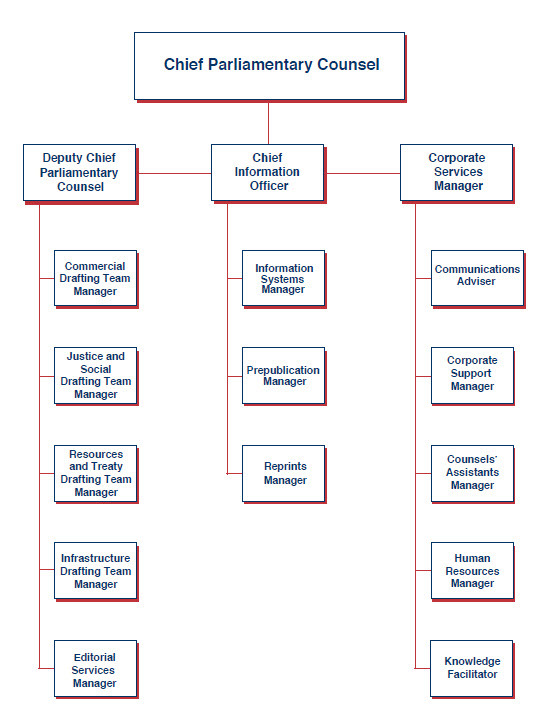 PCO managers, of whom 50% are female, are included in the staff numbers shown in the above table. The table also includes five fixed-term staff and one staff member currently on secondment to another department. The PCO is currently carrying out a Performance Improvement Framework (PIF) self-review and intends to undergo a formal PIF review in the 2013/14 year. The PCO maintains a risk register that is reviewed throughout the year. Its purpose is to assist the management and mitigation of the PCO’s major risks and the achievement of its outputs and deliverables. The framework includes procedures and practices designed to protect and enhance resources and enable the achievement of objectives. The PCO’s Audit and Risk Committee met four times during the 2012/13 year. The committee consists of two external independent members (including the chair) and two internal members. It provides independent advice and assurance to the Chief Parliamentary Counsel on the PCO’s systems of governance and internal control, risk management and compliance, and external accountability responsibilities. The PCO is in the process of replacing its disaster recovery plan for the NZL system, which will be fully operational early in the 2013/14 year. The PCO has moved services to the Revera all-of-government Infrastructure-as-a-Service, which provides a disaster recovery site in Auckland. The PCO has signed up to use the all-of-government contract (arising from the Ministry of Business, Innovation and Employment government procurement reform programme) for travel management services. The financial statements of the PCO for the year ended 30 June 2013, including the Statement of Service Performance, now follow. In my opinion, these financial statements and Statement of Service Performance fairly reflect the financial position and operations of the PCO for the year ended 30 June 2013. As at 30 June 2013, there are no contingent assets (30 June 2012: nil). As at 30 June 2013, there are no contingent liabilities (30 June 2012: nil). As at 30 June 2013, there are no guarantees or indemnities given under the Public Finance Act 1989 in respect of the activities of the PCO (30 June 2012: nil). For the year ended 30 June 2013, there are no instances of unappropriated expenses and capital expenditure (30 June 2012: nil). These are the financial statements of the PCO for the year ended 30 June 2013, which have been prepared pursuant to the Public Finance Act 1989 and which include the requirement to comply with New Zealand generally accepted accounting practice (NZ GAAP) and Treasury instructions. The PCO is a public benefit entity. Its primary objective is the drafting and publishing of legislation. The financial statements have been authorised for issue on 16 September 2013 by the Chief Parliamentary Counsel and the Corporate Services Manager. There is one standard, amendment, or interpretation issued but not yet effective that has not been early adopted, and that is relevant to the PCO. NZ IFRS 9 Financial Instruments will eventually replace NZ IAS 39 Financial Instruments: Recognition and Measurement. NZ IAS 39 is being replaced through the following three main phases: Phase 1 Classification and Measurement, Phase 2 Impairment Methodology, and Phase 3 Hedge Accounting. Phase 1 has been completed and has been published in the new financial instrument standard NZ IFRS 9. NZ IFRS 9 uses a single approach to determine whether a financial asset is measured at amortised cost or fair value, replacing the many different rules in NZ IAS 39. The approach in NZ IFRS 9 is based on how an entity manages its financial assets (its business model) and the contractual cash flow characteristics of the financial assets. The financial liability requirements are the same as those of NZ IAS 39, except for when an entity elects to designate a financial liability at fair value through the surplus/deficit. The new standard is required to be adopted for the year ended 30 June 2016. However, as a new Accounting Standards Framework will apply before this date, there is no certainty when an equivalent standard to NZ IFRS 9 will be applied by public benefit entities. The Minister of Commerce has approved a new Accounting Standards Framework (incorporating a Tier Strategy) developed by the External Reporting Board (XRB). Under this Accounting Standards Framework, the PCO will be eligible to apply the reduced disclosure regime (Tier 2 reporting entity) of the public sector Public Benefit Entity Accounting Standards. The effective date for the new standards for public sector entities is for reporting periods beginning on or after 1 July 2014. Therefore, the PCO will transition to the new standards in preparing its 30 June 2015 financial statements. The PCO has not assessed the implications of the new Accounting Standards Framework at this time. The budget figures are those presented in the Information Supporting the Estimates of Appropriations for the Government of New Zealand for the year ended 30 June 2013 (Main Estimates) and those amended by the Supplementary Estimates and any transfer made by Order in Council under the Public Finance Act 1989. The PCO pays a capital charge to the Crown on its average taxpayers’ funds as at 30 June and 31 December each year. The capital charge rate for the year ended 30 June 2013 was 8% (2012: 8%). The PCO had not yet been reimbursed for these payments at balance date. The amounts outstanding are current (less than 30 days), and no provision for impairment has been recognised (2012: nil). discount rate: 2.71%—5.50% per annum (30 June 2012: 2.43%—4.65%). The PCO does not have bank overdraft facilities as at 30 June 2013. The PCO manages its revenues, expenses, assets, liabilities, and general financial dealings prudently. The PCO’s equity is largely managed as a by-product of managing income, expenses, assets, liabilities and compliance with the Government Budget processes and with Treasury instructions. The PCO has been provided with funding from the Crown of $20.509 million (2011/12 $20.532 million) for specific purposes as set out in its founding legislation and the scope of the relevant government appropriations. The PCO also purchased goods and services from entities controlled, significantly influenced, or jointly controlled by the Crown. Purchases from these government-related entities for the year ended 30 June 2013 totalled $2.095 million (2011/12 $2.068 million). These purchases included the payment of a capital charge on its taxpayers’ funds to the Treasury ($1.207 million), lease payments to the Reserve Bank of New Zealand ($0.646 million), purchase of electricity from Genesis, air travel from Air New Zealand, auditing services payments to Audit New Zealand, contribution to Crown Law towards the Government Legal Services Programme, training programmes from the Leadership Development Centre, and internet and core network access from Parliamentary Service. The PCO also provided goods and services to entities controlled, significantly influenced, or jointly controlled by the Crown. Revenue from these government-related entities for the year ended 30 June 2013 totalled $0.206 million (2011/12 $0.365 million). The revenue included the secondment of PCO staff to the Ministry of Business, Innovation and Employment and the Serious Fraud Office, and reimbursement from the Ministry of Foreign Affairs and Trade Aid Programme for legislative drafting services provided to Pacific Island nations. The PCO does not have any post balance date events for 2012/13 (2011/12: nil). A net surplus of $1.062 million was recorded. This was owing to a number of factors. Significant factors are stated below. There was a surplus of $0.988 million from personnel-related expenditure. This resulted from timing factors associated with the filling of vacant positions, and a significant reduction in the amount of retiring leave provisions due to staff retiring. There was a surplus of $0.702 million in depreciation-related expenditure due to delays in the completion of milestones for a number of NZL system enhancements. There was a surplus of $0.386 million from printing-related expenditure as a result of lower than anticipated demand for legislative printing, None of the titles on the 2012/13 reprints programme were published, and the number of sets of annual bound volumes printed was almost 9% fewer than was produced in 2011/12. However, additional costs of $0.962 million in operating costs were incurred as a result of a completed tender process that selected providers for the hosting, on-going support, and development of the NZL system. The PCO agreed to provide outputs in 2012/13 to meet the requirements of the Attorney-General in terms of their nature, outcome emphasis, quality and quantity specifications, and cost. 1All Bills in category 1 were drafted and enacted with the exception of the Appropriation (2011/12 Financial Review) Bill that was introduced on 19 November 2012 and was enacted on 25 March 2013. Of the 66 Bills in category 2, 43 were enacted and the remaining Bills were drafted (with the exception of 2 Bills that the Government decided not to progress). regulations drafted by the PCO are reviewed once before being submitted to Cabinet for their legal effectiveness, workability, compliance, structure, and readability. secondary legislation drafted by the PCO is read in full at least once by Editorial Services to detect errors before it is made. Previously, the satisfaction rate was based on the average response to all survey questions. 2The performance measures and standards for peer reviewing exclude Bills drafted by the Pacific Island desk and local, private, and Members’ Bills. 3The performance measures and standards for proofreading exclude Bills drafted by the Pacific Island desk. 1For 2012/13, the appropriateness of the satisfaction measure for instructing departments was reviewed and improved upon. The level of satisfaction was measured using a 1 to 5 scale with 1 being very dissatisfied and 5 being very satisfied. The result was based on the proportion of instructing departments and agencies we surveyed that rated the timeliness as a 4 or 5 on that scale for the following statement: drafts of legislation were produced within agreed deadlines. The Appropriation voted includes section 26A appropriation transfers between output classes. 2No items on the 2012/13 reprints programme were reprinted as they all had outstanding amendments that will come into force in the 2013/14 financial year. Those items will be reprinted once the amendments come into force. 3Two Acts on the 2011/12 annual reprints programme were reprinted after 1 July 2012 as they both had outstanding amendments that came into force in the 2012/13 financial year. 4Eight titles on the 2010/11 annual reprints programme were reprinted after 1 July 2011 as they all hadoutstanding amendments that came into force in the 2011/12 financial year. 1 No items on the 2012/13 reprints programme were reprinted as they all had outstanding amendments that will come into force in the 2013/14 financial year. Those items will be reprinted once the amendments come into force. 2 Two Acts on the 2011/12 annual reprints programme were reprinted after 1 July 2012 as they both had outstanding amendments that came into force in the 2012/13 financial year. 3 Eight titles on the 2010/11 annual reprints programme were reprinted after 1 July 2011 as they all had outstanding amendments that came into force in the 2011/12 financial year. The Auditor-General is the auditor of the Parliamentary Counsel Office (the PCO). The Auditor-General has appointed me, Karen Young, using the staff and resources of Audit New Zealand, to carry out the audit of the financial statements and the non-financial performance information of the PCO on her behalf. Our audit was completed on 16 September 2013. This is the date at which our opinion is expressed. Material misstatements are differences or omissions of amounts and disclosures that, in our judgement, are likely to influence readers’ overall understanding of the financial statements and the non–financial performance information. If we had found material misstatements that were not corrected, we would have referred to them in our opinion. An audit involves carrying out procedures to obtain audit evidence about the amounts and disclosures in the financial statements and the non-financial performance information. The procedures selected depend on our judgement, including our assessment of risks of material misstatement of the financial statements and the non-financial performance information whether due to fraud or error. In making those risk assessments, we consider internal control relevant to the PCO’s preparation of the financial statements and the non-financial performance information that fairly reflect the matters to which they relate. We consider internal control in order to design audit procedures that are appropriate in the circumstances but not for the purpose of expressing an opinion on the effectiveness of the PCO’s internal control. We did not examine every transaction, nor do we guarantee complete accuracy of the financial statements and the non-financial performance information. Also we did not evaluate the security and controls over the electronic publication of the financial statements and non–financial performance information. fairly reflects its service performance and outcomes. The Chief Parliamentary Counsel is also responsible for such internal control as is determined is necessary to enable the preparation of financial statements and non-financial performance information that are free from material misstatement, whether due to fraud or error. The Chief Parliamentary Counsel is also responsible for the publication of the financial statements and non–financial performance information, whether in printed or electronic form. In addition to the audit, we have provide independent quality assurance over selection of an information technology provide for the New Zealand Legislation system, which is compatible with those independence requirements. Other than this assignment,we have no relationship with or interests in the PCO. This audit report relates to the financial statements and non-financial performance information of the Parliamentary Counsel Office for the year ended 30 June 2013 included on Parliamentary Counsel Office’s website. The Chief Parliamentary Counsel is responsible for the maintenance and integrity of Parliamentary Counsel Office’s website. We have not been engaged to report on the integrity of Parliamentary Counsel Office’s website. We accept no responsibility for any changes that may have occurred to the financial statements and non-financial performance information since they were initially presented on the website. The PCO is constituted as a separate statutory office by the Legislation Act 2012 (the 2012 Act). (The relevant provisions of the 2012 Act came into force on 12 December 2012. Prior to this the PCO was constituted as a separate office of Parliament by the Statutes Drafting and Compilation Act 1920 (the 1920 Act).) The PCO is under the control of the Attorney-General or, if there is no Attorney-General, the Prime Minister. During the reporting period, under section 4(1) of the Acts and Regulations Publication Act 1989, the PCO was responsible for the publication of Acts of Parliament (including reprinted Acts), Statutory Regulations (including reprinted Statutory Regulations), and Imperial Acts that have effect as part of the laws of New Zealand. The 2012 Act has since repealed the Acts and Regulations Publication Act 1989 but has continued these functions. manages a contract with Revera relating to syndicated procurement of infrastructure-as-a-service. 1Preparing the Annual Report: Technical and Process Guide for Departments (June 2013) www.treasury.govt.nz/publications/guidance/reporting/annualreports. 2Statement of Intent Parliamentary Counsel Office for the period 1 July 2012 to 30 June 2017 www.pco.parliament.govt.nz/soi2012-2017/. 3 Justice Sector—Information Supporting the Estimates 2012/13 www.treasury.govt.nz/budget/2012/ise/v7. 5 This is further explained in the Statement of Intent Parliamentary Counsel Office for the period 1 July 2012 to 30 June 2017, page 9. 6 "Officialisation" refers to the steps necessary to make each principal enactment in the database of legislation on the NZL website an accurate and authoritative version of compiled legislation. Auditing work is now underway. See Officialisation. 7 The New Zealand Legislation website, at www.legislation.govt.nz.